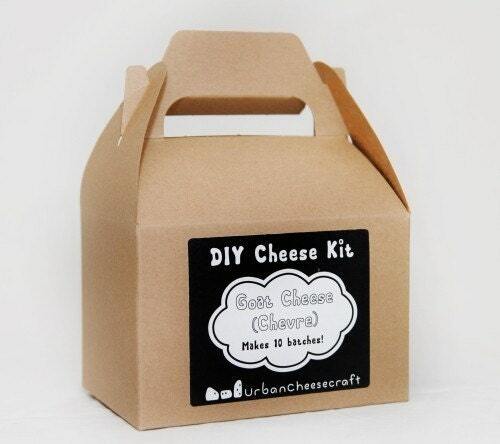 Simple Crumbly Goat Cheese | Urban Cheesecraft- DIY Cheese Kits and Cheese Making Supplies for Urbanites with Country Appetites! When creamy and spreadable isn’t the goal, but rather firm crumbles for salad or to top dishes, try this recipe. You’ll be done in an hour or two (depends on if you want it very firm and chilled). Step 1- Mix the citric acid into ½ cup of water and stir. Let it sit and dissolve. Step 2- Heat the milk in your pot until foamy and steamy (190˚F-195˚F) while stirring often to prevent scorching. Step 3- Turn the heat to low, before the foam subsides, drizzle in the citric acid solution. Stir and cook for 15-30 seconds. You should see some subtle curdling. Step 4- Remove from the heat and continue to stir gently until you see a clear separation between curds and whey. If the whey is whitish (should be yellowish-green), sprinkle a tiny bit more citric acid in the pot and stir. Step 5- Gently pour the curds and whey into a cloth-lined colander (the curds can be very small). Drain for 5-10 minutes. Mix in your salt and stir the curds gently as they dry a little more. Add herbs if desired (split the batch if you want to try different flavors). Step 6- Time to shape and press! -For beautiful little cheese wheels, spoon some curds to fill about 1/3 of your goat cheese molds (place a flat tray underneath to catch any liquid) and press gently with your fingertips. If you like a nice firm cheese, you can place a full glass jar or bottle in each mold to press the wheels a little more. Press down gently but stop if curds seep out. -For a nice rustic wheel. Leave the rest of the curds (or all of the curds) in the cloth and gather them up into a mound. Fold the cloth corners over the curds, place a plate and 1/2 gal. of water as a weight on top to press. Allow the cheeses in the molds and colander to press until your desired firmness (usually 1 hour is plenty in the fridge but overnight can give you a firm cheese similar to feta). The cheese will be ready to crumble, slice and enjoy with your favorite fruit and bread.